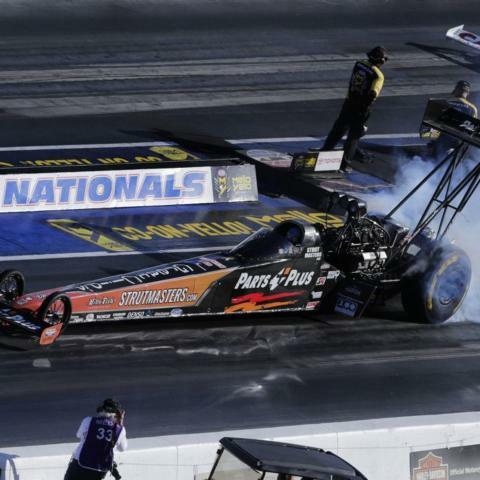 Clay Millican remained a contender for the Top Fuel world championship after securing his 10th No. 1 qualifying position on the season Saturday afternoon at the NHRA Toyota Nationals at The Strip at Las Vegas Motor Speedway. Tommy Johnson Jr. (Funny Car), Jeg Coughlin Jr. (Pro Stock) and Hector Arana Jr. (Pro Stock Motorcycle) are the No. 1 qualifiers in their respective categories at the fifth of six playoff events during the 2018 NHRA Mello Yello Drag Racing Series Countdown to the Championship. Millican was able to carry his 3.699-second pass at 327.82 mph on Friday night in his Parts Plus/Great Clips dragster for the second No. 1 position at this event. He will face Greg Carrillo when eliminations begin on Sunday. "This team is incredible," Millican said. "This is something I would have never dreamed of. So proud of what this team has done all season long. It is amazing." Millican trails points leader Steve Torrence, who qualified second. Torrence will face Shawn Reed and can secure his first world championship if he goes one round further than Millican during eliminations. Johnson earned his third consecutive No. 1 with his pass of 3.879 at 327.82 during the final pass of the fourth qualifying session in his Make-A-Wish Dodge Charger R/T. Johnson has 18 career No. 1 positions and races Jeff Arend on Sunday. "Our car has been running so well as of late," Johnson said. "You want to come into the Countdown, and you have to bring everything you've got for all the races. You have to perform your best you have all season. We have done that except for Sunday. "I'm excited about tomorrow, I don't know if I will be able to sleep tonight. I'm ready to go." Robert Hight, who leads the Funny Car points, qualified seventh and will race Shawn Langdon on Sunday. J.R. Todd, who trails Hight in the standings, qualified second and races Richard Townsend. In Pro Stock, Coughlin powered to his fifth No. 1 position of the season during the first session on Saturday with his pass of 6.628 at 206.95 in his JEGS.com/Elite/Chevrolet Camaro. This is the first time in his career the veteran racer has posted five top positions in a single season. Coughlin is second in the category points standings and will line up against Steve Graham in eliminations. "It is certainly coming at a great time," Coughlin said. "As the Countdown narrows tomorrow and two seeks in Pomona, every point counts and every round counts. Right now, we are second in the points and have a long way to go to climb up to that top spot and need a lot of help from some of our competitors, but to sit on pole here in Las Vegas feels great. Points leader Tanner Gray qualified fifth and will face Alan Prusiensky on Sunday. Arana Jr. moved to the No. 1 position in Pro Stock Motorcycle during the first qualifying position of the day on Saturday with his run of 6.845 at 196.44 on his Lucas Oil Buell. This is the third No. 1 qualifying position for the season, first since the event in Richmond, Va., and the 22nd of his career. He will race Make Paquette when eliminations begin on Sunday. "We made a really good pass the first session," Arana said. "Right there, that gave us the confidence boost and the momentum to be able to go as fast as we are going. We didn't have to play catchup or figure out a tune-up. "The tune-up, we nailed it right away, then we were able to tickle it a little bit. We really feel confident going into race day tomorrow." Points leader Matt Smith qualified eighth and will face L.E. Tonglet, who is second in points and qualified ninth. Eddie Krawiec, who is third in points, qualified second and races Ron Tornow when eliminations begin. Eliminations for the NHRA Toyota Nationals begin at 11 a.m. Pacific Time on Sunday. Mike Castellana improved on his No. 1 qualifying pass from Friday to remain atop the field going into race day at the E3 Spark Plugs NHRA Pro Mod Drag Racing Series presented by J&A Service portion of the NHRA Toyota Nationals. This weekend's Pro Mod racing, presented by Trask Performance, is the last race of the season for the category. Castellana posted a run of 5.710-seconds at 252.80 during the first qualifying session of the day on Saturday in his '17 Camaro. Mike Janis aims for his first category crown as the current points leader, is qualified fifth and will face Mike Caruso on Sunday. Rickie Smith trials Janis in the standings and will begin race day from the bottom half of the field after qualifying 14th. He will race Jeremy Ray in eliminations. E3 Spark Plugs NHRA Pro Mod Drag Racing Series eliminations begin Sunday at 9 a.m. at The Strip at Las Vegas Motor Speedway. 1. 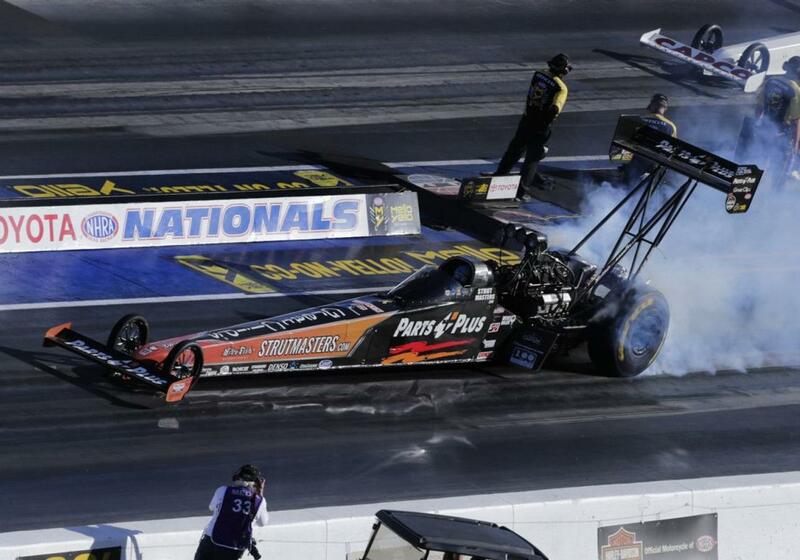 Clay Millican, 3.699 seconds, 327.82 mph vs. 16. Greg Carrillo, 3.939, 305.98; 2. Steve Torrence, 3.702, 333.33 vs. 15. Shawn Reed, 3.876, 295.34; 3. Brittany Force, 3.723, 330.88 vs. 14. Mike Salinas, 3.824, 280.72; 4. Leah Pritchett, 3.731, 322.65 vs. 13. Troy Buff, 3.804, 308.57; 5. Antron Brown, 3.741, 322.88 vs. 12. Blake Alexander, 3.800, 321.12; 6. Doug Kalitta, 3.742, 326.00 vs. 11. Richie Crampton, 3.799, 318.39; 7. Billy Torrence, 3.760, 327.90 vs. 10. Terry McMillen, 3.784, 326.32; 8. Scott Palmer, 3.768, 326.48 vs. 9. Tony Schumacher, 3.772, 330.15. Did not qualify: 17. Terry Haddock, 4.018, 295.21; 18. Terry Totten, 4.788, 155.31. 1. Tommy Johnson Jr., Dodge Charger, 3.879, 327.82 vs. 16. Jeff Arend, Chevy Monte Carlo, 4.119, 302.35; 2. J.R. Todd, Toyota Camry, 3.911, 327.19 vs. 15. Richard Townsend, Camry, 4.060, 308.50; 3. Jack Beckman, Charger, 3.922, 327.19 vs. 14. Jim Campbell, Charger, 4.054, 312.06; 4. Bob Tasca III, Ford Mustang, 3.924, 321.65 vs. 13. Jonnie Lindberg, Mustang, 4.050, 314.24; 5. John Force, Chevy Camaro, 3.926, 330.55 vs. 12. Ron Capps, Charger, 3.971, 315.71; 6. Courtney Force, Camaro, 3.926, 328.46 vs. 11. Cruz Pedregon, Camry, 3.968, 323.04; 7. Robert Hight, Camaro, 3.927, 328.38 vs. 10. Shawn Langdon, Camry, 3.965, 319.67; 8. Tim Wilkerson, Mustang, 3.932, 319.90 vs. 9. Matt Hagan, Charger, 3.949, 322.65. Did not qualify: 17. Gary Densham, 4.192, 273.33; 18. Bob Bode, 4.253, 265.74; 19. Jeff Diehl, 4.911, 165.11. 1. Jeg Coughlin Jr., Chevy Camaro, 6.628, 206.73 vs. 16. Steve Graham, Camaro, 6.715, 205.13; 2. Jason Line, Camaro, 6.628, 206.61 vs. 15. Kenny Delco, Camaro, 6.693, 205.51; 3. Matt Hartford, Camaro, 6.629, 206.26 vs. 14. Fernando Cuadra, Camaro, 6.686, 206.26; 4. Drew Skillman, Camaro, 6.631, 206.86 vs. 13. Vincent Nobile, Camaro, 6.653, 203.89; 5. Tanner Gray, Camaro, 6.631, 205.79 vs. 12. Alan Prusiensky, Dodge Dart, 6.650, 205.79; 6. Chris McGaha, Camaro, 6.633, 207.91 vs. 11. Deric Kramer, Camaro, 6.650, 206.70; 7. Bo Butner, Camaro, 6.636, 207.56 vs. 10. Alex Laughlin, Camaro, 6.643, 205.63; 8. Erica Enders, Camaro, 6.636, 206.70 vs. 9. Greg Anderson, Camaro, 6.638, 205.57. Did not qualify: 17. Val Smeland, 6.762, 203.12; 18. Joey Grose, 6.803, 202.27; 19. Tom Huggins, 6.816, 202.64. 1. Hector Arana Jr., EBR, 6.845, 196.44 vs. 16. Mark Paquette, Buell, 6.990, 189.52; 2. Eddie Krawiec, Harley-Davidson, 6.859, 195.65 vs. 15. Ron Tornow, Buell, 6.987, 189.98; 3. Hector Arana, EBR, 6.863, 194.88 vs. 14. Ryan Oehler, Buell, 6.980, 193.49; 4. Chip Ellis, Harley-Davidson, 6.899, 194.60 vs. 13. Kelly Clontz, Suzuki, 6.972, 190.97; 5. Andrew Hines, Harley-Davidson, 6.911, 193.43 vs. 12. Scotty Pollacheck, Suzuki, 6.963, 190.89; 6. Angie Smith, Buell, 6.921, 191.19 vs. 11. Angelle Sampey, Buell, 6.953, 191.73; 7. Steve Johnson, Suzuki, 6.926, 189.39 vs. 10. Jerry Savoie, Suzuki, 6.953, 191.87; 8. Matt Smith, EBR, 6.931, 195.17 vs. 9. LE Tonglet, Suzuki, 6.931, 194.32. Did not qualify: 17. Karen Stoffer, 6.991, 190.51; 18. Katie Sullivan, 7.000, 192.74; 19. Cory Reed, 7.020, 190.59; 20. Freddie Camarena, 7.040, 191.57; 21. Anthony Vanetti, 7.153, 184.09; 22. Maurice Allen, 7.195, 184.39. 1. Mike Castellana, Chevy Camaro, 5.710, 252.80 vs. 16. Clint Satterfield, Camaro, 5.851, 248.39; 2. Todd Tutterow, Camaro, 5.721, 243.85 vs. 15. Jim Whiteley, Camaro, 5.850, 246.30; 3. Jeremy Ray, Chevy Corvette, 5.732, 247.93 vs. 14. Rickie Smith, Camaro, 5.814, 247.43; 4. Jose Gonzalez, Camaro, 5.742, 258.07 vs. 13. Shane Molinari, Pontiac firebird, 5.809, 255.63; 5. Mike Janis, Camaro, 5.747, 249.53 vs. 12. Marc Caruso, Camaro, 5.801, 246.26; 6. Rick Hord, Corvette, 5.749, 253.33 vs. 11. Chad Green, Corvette, 5.789, 246.98; 7. Sidnei Frigo, Camaro, 5.753, 256.50 vs. 10. Steve Jackson, Camaro, 5.788, 246.21; 8. Steven Whiteley, Camaro, 5.776, 251.25 vs. 9. Michael Biehle, Ford Mustang, 5.788, 255.87. Did not qualify: 17. Khalid alBalooshi, 5.851, 246.35; 18. Bob Rahaim, 5.861, 243.50; 19. Steve Matusek, 5.862, 247.66; 20. Danny Rowe, 5.869, 249.63; 21. Brandon Snider, 5.888, 241.89; 22. Doug Winters, 5.894, 242.80; 23. Scott Oksas, 5.910, 238.60; 24. Harry Hruska, 5.981, 248.84; 25. Rick Distefano, 6.092, 239.70; 26. Chip King, 6.998, 109.52.